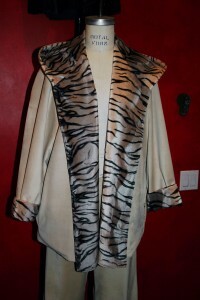 This women’s suede swing coat style jacket is lined with faux fur in a tiger print. The colors are pale puce with darker shades and black combined in the fur trim. The jacket has a loose hood, cuffed sleeves and a large rolled out lapel which can be pulled together and wrapped one side over the other. The entire garment is cut loose and generously. 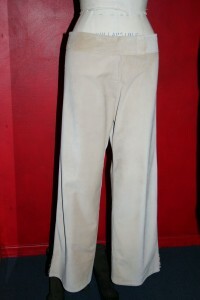 The pants are an ankle length with a generous leg, fitted at the waist, lined in a satiny fabric and trimmed at the bottom cuff where there is a short slit. The pencil shape skirt is unlined in matching faux fur with a black leather waistband and an exposed zipper up the front.